To be quite honest, it still feels surreal that I finally have a community here in Pampanga. I thought I’d miss Manila so much that I will find myself back in its arms every weekend; but here I am, leaving a weekend open to meet up with the Pampanga Bloggers Society. Yes, I am now officially part of group! On July 30-31, 2016, the Pampanga Bloggers Society will be hosting the Pampanga Restaurant Tour 2016. This will be my first major event with the group and I’m really excited to meet the other members. 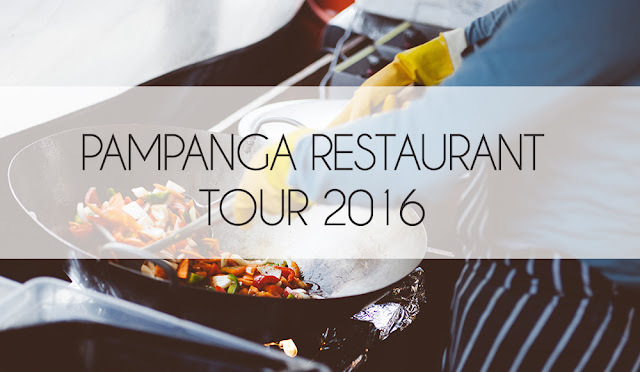 Participating restaurants are: Café Fleur, Abe’s Farm, Café Noelle, Toll House and Apag Marangle. 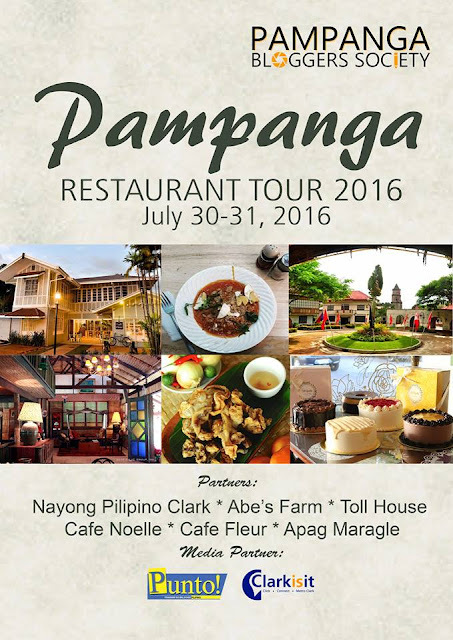 Plus there would be a heritage tour also at Nayong Filipino in Clark. I have been to Nayong Filipino in Clark before but I think it was when they just opened so there wasn’t much to see. I’m hoping to see more on my next visit! We would also like to thank our media partners: ABS-CBN Pampanga, Punto News Paper, and Sun Star Pampanga. I’m hoping to meet more bloggers in the future and that our blog community here in San Fernando grows more. So if you’re also a blogger from Pampanga, do get in touch with us, k? A restaurant tour must be such a fun and delicous experience! I bet you had too much fun :) Really nice that you are getting more involved with other bloggers in Pampanga. Here in my city I do not know any other bloggers to be honest. Thats really a pity! Congrats on being a member of the Pampanga bloggers association!! I wish you all the best! A restaurant tour sounds like a great event. Have fun. This looks like such a fun event to network over some really delicious food, what's better than that!? I wish I could go, but perhaps someday I'll be able to make my way to the Philippines to meet you :) I hope you have a wonderful time at the event and thanks for sharing, beauty! Gosh, I have heard of pub tour before but never restaurant tour! That sounds like my sort of thing to do. Fun event Thank u for sharing! Can a brand, created by a young Swiss designer, combine tailoring, high quality of textiles and above all, respect for the environment? Lovely! Wish I could go! Wow sounds so lovely! Wish i could go!! Have fun!